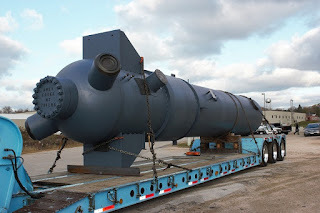 Feedwater Heater Manufacturer - When it comes time for a new, replacement, replacement bundle, retube or any service (include explosive tube plugging) of you Feedwater Heater(s) - contact AM-EX for expert technical advise and cost competitive pricing. AM-EX specializes in the manufacture and field service of High Pressure Feedwater Heaters, Low Pressure Feedwater Heaters, Intermediate Pressure Feedwater Heaters, Vertical Head Down Feedwater Heaters, Vertical Head Up Feedwater Heaters, and Horizonal Feedwater Heaters. Ask you AM-EX professional about AM-EX signature designs such as the Long Drains Cooler and No-Tube-In-Window desuperheating zone and drains cooler. AM-EX has three locations, all located in Wisconsin, USA. AM-EX is an American Owned and Operated business, under the same leadership for over three decades. Contact AM-EX about your Feedwater Heater needs.